Home Studies: What Are They and Why Are They Important? Our adoption adventure began several years ago with the strong desire for more children. We had always thought we would have a big family, but due to health reasons, at 34 years of age we had to accept that we would have no more children biologically. Looking back now, I can see how God was working on our hearts and preparing us for His plan for our family. It started with our minister sharing sermons on orphan care and how God calls all of us to care for orphans. I found myself not being able to sleep at night. God strengthened both mine and my husband’s relationship with Him. We got into our Bibles, went to an orphan seminar that was held by New Beginnings at our church, and spoke to many couples who had adopted. For us, the journey was a several year walk with God. We prayed and prayed about the path God wanted us to take. My husband and I felt the call for adoption, but initially, I thought we needed a baby. My husband felt God calling us to adopt an older child. Through reading the Bible and great amounts of prayer, God gave us several signs that pointed us exactly to where He wanted us to go. We went to New Beginnings and began the process to bring home a brother to add to our family of three the summer of 2014. We involved our son, Thaxton, in the discussions about adoption. 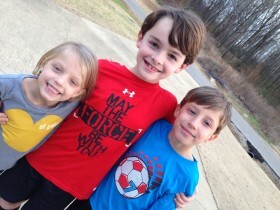 We decided, at that time, that a boy closer to Thaxton’s age was the best fit for our family. In the beginning, the process was a lot of paperwork and a lot of waiting for forms to come in and send back out again. We received the referral for a boy, and we fell in love. During one video we received, we saw a sweet little face that captured our hearts as well. Little did we know at the time that God was working behind the scenes on something more for our family. We accepted the referral for the boy and continued the process. To our surprise, the little boy had a sister, and she was available for adoption! Possibly one of the most frustrating times of the adoption for us was also one of the biggest times in our spiritual walk with God to date. We had to give all to God’s plan. All fears and worries had to be given to Him. I had absolutely zero control or idea how everything would end up working out for our family. You see, in order to keep the brother and sister together, we had to let them go. They had to first be offered as a sibling pair domestically to Poland. We knew that keeping them together was the best option for them, so we prayed and waited, and prayed and waited. We knew that if God wanted those babies with us, they would be. We prayed selflessly that God find the perfect family for the little boy and girl. The first of June we got the best news. They were available for us to adopt internationally. We went into the adoption thinking just a brother, but I cannot imagine our family any different than it is now…from a family of three to our big, beautiful, bold, boisterous family of five! Poland is a amazing country with a rich history that we knew absolutely zero about. We immediately began researching and looking up foods and customs from Poland. I have a very picky husband in regards to food, so that was a concern he had. I had read many articles about the gelato there, so I just thought…one might be able to live off of gelato for several weeks if need be. Once we got there though, we found several places we liked to eat, and the grocery stores had everything we needed. We went during a time that the weather was warmer than usual, so we walked and enjoyed the beautiful parks, museums, and local customs. We fell deeply in love with Poland and look forward to going back one day when our kids are older. From the time we left our apartment in Poland, to the time we pulled into our driveway, we had been in transit for 19 hours . Needless to say, we were all exhausted. Our parents met us at the airport and took us all to eat. All three kids fell asleep on the ride home. Our new son and daughter, Harry and Anna Rose, woke up when we pulled into the garage. They seemed to catch a second wind, and they excitedly toured the house. We have two schnauzers, who went over to both kids, sniffed them, licked them, and walked away…basically saying, “welcome home, you two can stay”. The puppies love on them and the kids adore the puppies in return. Harry and Anna Rose loved seeing their rooms, and we tucked some happy kids into their new beds that first night. Possibly one of the most asked questions we get is, how are the kids adjusting? I always shrug my shoulders and giggle. My answer is the same every time. God loves adoption, and when He convicts and calls you, He makes things work in an amazing way. Harry started school after we had been home for a few days because he wanted to. He saw his big brother, Thaxton, going to school, and he wanted to go to school. Harry has helped Thaxton loosen up. Harry is very charismatic. He walks into the room and everyone is drawn to him immediately. I have always joked that Thax was the oldest eight year old I have ever met. It warms my heart to see him bond with his brother and sister. I love hearing them giggle and watching them kick soccer balls, throw footballs, and play games. Thaxton has been great for Harry too because he works with him on school work. Anna Rose has changed so much from the shy little insecure girl we first met. She is “rainbows and unicorns” all the time. She is always smiling and laughing. We joke how she is the smallest yet loudest one in the house. She started school a week after we returned home. They both love school. When I say they love school, I am not exaggerating. They LOVE school! Harry plays on the same soccer team as his big brother. They are the Landsharks. He quickly learned to throw up the fin when his team scored a goal. All the sweet boys welcomed him and treated him like he had always been on the team. We are Mississippi State fans, but we are learning to cope with him throwing up a fin for the sake of the game. Go Landsharks! Anna Rose refers to herself as a “Mississippi gurla.” They have both made friends at school, church, and in our neighborhood. The children at their school are so accepting and protective. Harry and Anna Rose are treated like local celebrities and everyone loves them and knows their names. Our community supported this adoption and continue to support and love on our babies. Yes, we have more clothes to wash, more dishes to clean, more homework to check and tests to study for each week. But more importantly….we have more hugs to give, more hands to hold, more pitter pats of sweet little feet running throughout the house to hear, more kisses to give and get, more devotional time to take and sweet Polish prayers to make, more laughter to hear (boy do we ever laugh a lot), and more sweet “I love yous” to share. We are so thankful that we were obedient to God’s call, and we trusted His plan for our family. Jeremiah 29:11 has become permanently tattooed on my heart. The best advice I would give prospective adoptive parents is to surrender the thought of adoption to God. Pray and read your Bible and talk to other families who have adopted. 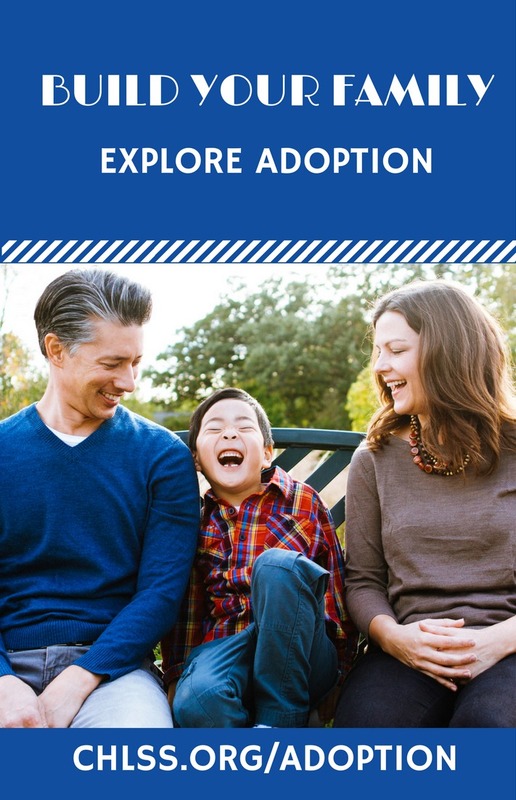 In addition, be open and honest with your spouse, and really listen to what one another has to say about adoption. I am open and honest with our experience. We are not a Lifetime movie. We have struggles and obstacles, but I would not trade our new life for anything in the world. After blessing us with Thaxton, God closed my womb in order to open our hearts to adoption. For that, I am eternally thankful. Clarity like that could never come from anywhere but God. I cannot wait to see the ways that God uses these babies in the future to serve Him and further His kingdom.